Before it’s too late and they run out of season, it’s better to write down this recipe. Courgettes are one of the most versatile vegetables: raw, deep fried, stuffed, grilled, sautéed, with pasta or with rice, whizzed up in a tempting cream or simply steamed and seasoned with a extra virgin olive oil, salt and pepper, they are always appetizing. The minced parsley, which will be added only when binding the rice, will match the sweet flavor of courgettes with a fresh herby note. If you want to use chicken stock or any stock mead with meat, you would do better to skim the excess of fat before using it, so it will not weight down the flavours. If you can’t have access to any white wine, then simply skip this part after toasting the rice. Put the vegetable stock to boil on a high heat and add the salt. If you are using stock cubes or stock gel portions, season the stock to your taste. Thoroughly wash the courgettes, dry them up with the tea towel and chop off their ends. Halve them lengthwise. If the courgettes are quite big (more than 3cm of diameter) cut them in quarters and cut off the spongy and seedy centre. Chop them into thin slices (3 to 4 millimetres thick). Set aside. Thoroughly wash the parsley and dry it with the towel without making any pressure on it; keep a couple of stalks aside. With the remaining, separate the leaves from the stalks. Make a “bouquet garni” with the stalks and set aside. Put the saucepan on medium heat with the butter and the parsley stalks (step 2 - pic. A). Mince the shallots into a brunoise*. When the butter has melted completely, add the shallots, spread them evenly and allow them to absorb the fat (step 2 - pic. B). Increase slightly the heat and let them start frying gently until they become slightly translucent. Season with salt and black pepper, and keep stirring while they tenderise. Add the courgettes. Stir on gentle heat for 10-15 minutes, letting the courgettes cooking completely. Make them gain a light golden colour but do not make them brown (step 2 - pic. C). Meanwhile, grate the parmigiano cheese and set aside. With a paring knife, chop off the shallot’s tip. Clean the roots, halve it and peel off the tunics. Put each half facing down on a chopping board. With either the paring knife or the tip of the chef knife, make vertical cuts - 2millimeters apart from each other - driving the tip of the knife as close to the roots as possible. Hold the shallot together with one hand’s fingers, get the chef knife and with a fulcrum movement complete the mincing with narrow cuts. While the courgettes gets to a gentle simmer, start toasting the rice. Toasting the rice is absolutely essential for a good and appropriate final result. 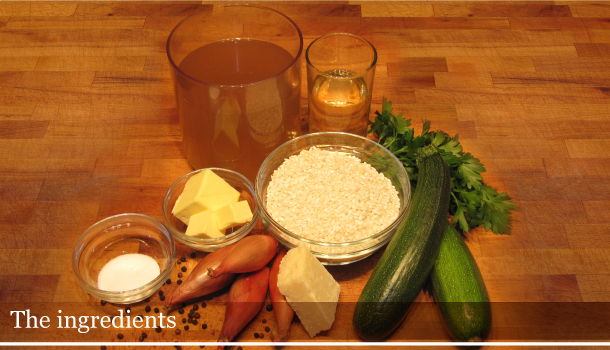 If its grain would not be going through this process, instead of a risotto, you would be serving a mushy sticky soup. The exposure of each single rice grain to direct heat will seal its pores allowing the grains to be maintained whole during the cooking. Immediately add the rice to the saucepan with the courgettes and stir evenly (step 3 - pic. B). Meanwhile, finely mince the parsley (to preserve the flavors and to avoid the oxidation, it would be better to do this as close as possible to binding the rice before serving). Check the seasoning, correct the salt if necessary and stir (step 3 - pic. B). Get the saucepan off the heat. Let the rice rest for about one and a half minutes (ratio should be: three minute every kilo of risotto). This resting is essential to stabilise the starches before adding the butter. Then, add the butter to the risotto and stir allowing the fat emulsifying with the starchy liquor (step 5 - pic. A). Use the spoon or the spatula to bring the rice from the outside to the centre in large circular movements, collecting it from the bottom and moving it to the top. Add the cheese and the parsley, then stir again to mix them evenly (step 5 - pic. B). The mixture will gain consistency becoming creamy and billowy or “all’onda” as we call it in Italian. If you think it’s still too thick, gradually add small amounts of stock and stir again. That's why it is easier to bind the risotto when it is slightly drier rather than too runny: after adding the butter and the cheese you can't put it back on the hobs.